Learning from the past. Anticipating the future. The world is shifting towards a more fluid enterprise paradigm. Responsive operations are outsmarting fixed strategies. Flexible organizational models are thriving where rigid models can’t. Digitally integrated businesses are overwhelming siloed decision-makers. The future is fundamentally changing the present. The status quo is already in the past. of senior executives see the “digital” organization as critical to success. Innovation is the only way forward. of the jobs available in 10 years’ time don’t yet exist. of executives view organizational redesign as a strategic priority. Andryan IT: Empowering People. 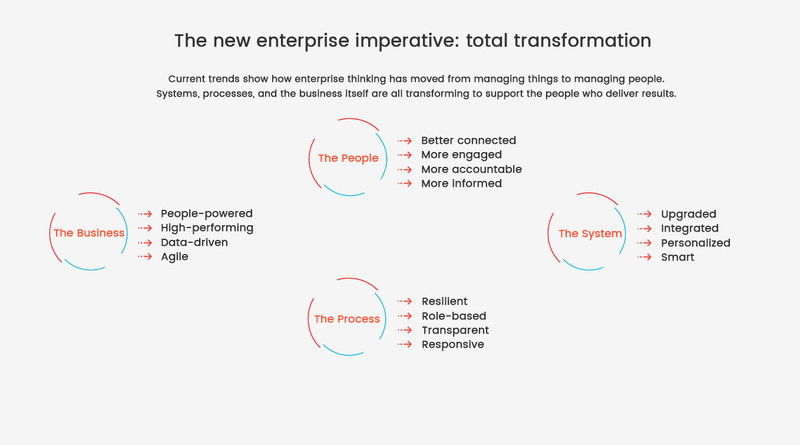 Transforming Enterprises. Founded in 2007, Andryan’s rise as an integration champion puts it at the forefront of the HCM and ERP world. In just 10 years, Andryan has implemented cutting-edge solutions for leading enterprises across government, banking, education, airline, airport, transportation, financial , marine, retail, property and insurance sectors. Today, Andryan offers deeper integration support than ever before, with in-house software development and IT support capabilities available onsite and on-demand. Its onshore teams and regional know-how help enterprises implement their transformation strategies across their operations, changing the way they work and impacting the world around them. Over a decade of service and support, with results that speak for themselves.